After being released from prison in Moscow, Garry Kasparov gave an impromptu news conference during which he warned that Russia was heading toward chaos. Garry Kasparov has been on a forced hunger strike, for fear of being poisoned, while serving his five-day sentence in a Moscow jail. Kasparov's release is expected today. When Bobby Fischer was in a Japanese prison, Boris Spassky wrote a letter to president George W. Bush in which he famously declared, "Arrest me. And put me in the same cell with Bobby Fischer. And give us a chess set." Yesterday, in a scene that was eerily reminiscent of Spassky's letter, Anatoly Karpov attempted to visit Garry Kasparov in a Moscow jail. But Karpov was not permitted to see his old rival. He told Radio Free Europe, "In Russia right now we have, what, four world chess champions? 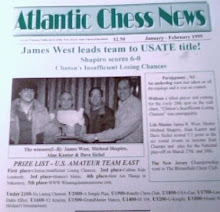 And of course the fate of any one of them is important to other chess players, both in Russia and abroad." Susan Polgar was the first woman to achieve the rank of grandmaster. Recently, she was featured on British television in a series called My Brilliant Brain. My favorite part is when Polgar undergoes an MRI scan of her brain while she is looking at photographs of famous chess players, and then at chess positions from games that she has played in the past. The MRI scan reveals that, in both cases, she uses the same part of her brain. 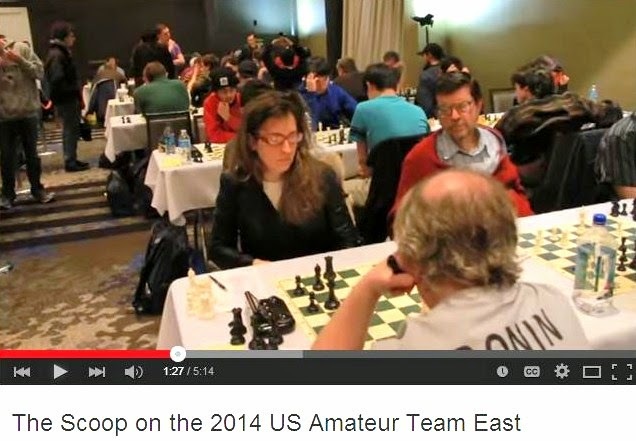 This means that, for Polgar, remembering a chess position is no more difficult than recognizing a familiar face! Garry Kasparov was arrested Saturday in Moscow for organizing an unsanctioned anti-government rally. Kasaparov was sentenced to five days in jail. Yesterday, at the Viking quads in Mount Arlington, I had a score of 1-0-2. These are the games. 48.Bf6 Ke8 49.Ke4 Kd7 50.a4 Ke6 51.Bc3 f5+ 52.Ke3 Kd5 53.b4 Kc4 54.Be1 Bg7 55.b5 axb5 56.axb5 Kxb5 57.Kf3 Kc4 58.Bh4 Kd3 59.Be7 Bh6 60.Bd8 Kd4 61.Bf6+ Kd5 62.Bd8 Ke6 63.Ba5, draw. 12.Be3 Bxe3 13.fxe3 Qxe3 14.Qd2 Bf5 15.Qxe3 Rxe3 16.Kf2 Rae8 17.Ned4 Bxd3 18.Nxc6 bxc6 19.Nd4 c5 20.Nb5 Re2+ 21.Kg1, White resigns. 16.e5 dxe5 17.Rge1 Qxd2 18.Rxd2 Nc4 19.Rd4 O-O 20.Rxc4 exf4 21.Rxc6 Bd4 22.Re2 Rfe8 23.a4 Rxe2 24.Nxe2 Bxf2 25.Nxf4 Bg1 26.h3 Bh2 27.Nd5 a5 28.c4 Kh7 29.Kc2 Re8, draw. Mig Greengard of The Daily Dirt Chess Blog reports that Bobby Fischer has been hospitalized in Reykjavik for several weeks. Fischer's unknown ailment is not a threat to his life. Tests are being performed to diagnose the illness. The title of today's post is my advice to Sam Sloan in his legal action versus Paul Truong and others. As Mark Twain once said, "A man who acts as his own attorney has a fool for a client." Having played chess over the board against both Sloan and Truong, I am not sure which side to root for in this lawsuit. The Mottershead report indicates that there is merit in Sloan's claim that Truong impersonated him on the Internet. But it looks as if Sloan's case may be dismissed due to technical errors in his complaint. A Bust to "King's Gambit"
There is an unfortunate tendency, whenever a well-written book like Paul Hoffman's King's Gambit [Hyperion, 2007, 433 pages] is published, for reviewers to say nothing but nice things about it. Perhaps this is because such books have been so few and far between that no one wants to be negativistic, for fear of jeopardizing its chances, when a new one finally comes along. My journalistic philosophy, to the contrary, has always been that the book reviewer's primary responsibility is to the reader and not the author. In this vein, I will now list some of the shortcomings in Hoffman's book. Let me begin by stating that I enjoyed reading King's Gambit. The last non-fiction book on chess that made me feel this way was Searching for Bobby Fischer. In many ways, Paul Hoffman covers the same material that Fred Waitzkin did, but in reverse. This time, it is the chess son, not the chess father, who does the storytelling. But it is the inexactitude in these tales of Hoffman that worries me. 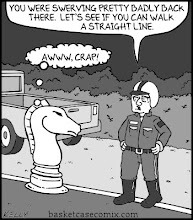 Chess masters like myself learn the discipline of putting aside our subjective feelings and analyzing with complete objectivity. Of course, we are only human and never 100% successful in our efforts. But the author, a 1900 rated player, seems to be far too undisciplined. Allow me to make the unkind observation that, if Hoffman is as imprecise with his chess moves as he is with (at least some of) his anecdotes, it is no wonder that he has never achieved a master's rating. Here are a few examples of inaccurate anecdotes, concerning people that I know. In 1989, when I reviewed Searching for Bobby Fischer, I wrote that Fred Waitzkin's keen insights enabled me to see, as though for the first time, chess players that I had already been paired against. I can not say the same for Hoffman because the Nicholas Rossolimo in King's Gambit is unrecognizable to me. As portrayed by Hoffman, Rossolimo comes across as an alcoholic whose drinking problem may have led to his accidental death by falling down a flight of stairs in 1975. 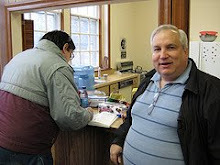 Like Hoffman, I also played against Rossolimo in his chess salon, within walking distance of the Marshall Chess Club. In my case, it was one game for the usual $5 fee. I was accompanied by two other club members who were Class B players, as I was back then. Believe it or not, I made it to a minor piece ending with even pawns. But the pawn structure favored Rossolimo's bishop over my knight, and I soon lost. I can still recall how courteous Rossolimo was in accepting my resignation. I saw nothing to indicate that he was anything but sober. No doubt Hoffman's footnote, pertaining to Rossolimo's untimely death, is the official version. I will give you the unofficial version as told to me, within days of the event, by a New York chess player who seemed to know what he was talking about. His story went that Rossolimo lived in a tough neighborhood. One night, in late July 1975, a couple of muggers waited for Rossolimo at the top of the stairs in his apartment building. In the ensuing struggle, Rossolimo either fell or was pushed down the stairs, suffering his fatal injury. I am not certain which version of events is the correct one. All I can say is that the chess player's story rang true when I heard it. One of the more humorous anecdotes told by Paul Hoffman is his victory against Noah Siegel, a 2300 rated player, who was the highest rated opponent ever beaten by Hoffman, at least until he defeated FIDE master Asa Hoffmann in a tournament at the Marshall Chess Club. I got a kick out of Hoffman's failure to realize that Siegel was acknowledging checkmate, not offering a draw, at the end of the game. What I found less amusing was Hoffman's describing the opening as a French defense against which Hoffman played the exchange variation, just as Bobby Fischer had done. This story is wrong on two counts. From my own experience against Siegel, I know that he favors the Caro-Kann defense. And Bobby Fischer never played the exchange variation against the French, although he did play it against the Caro-Kann. The likely explanation for this confusion is that Siegel played the Caro-Kann, not the French, against Hoffman. What this would mean is that, not only was Hoffman unaware that he had checkmated his opponent at the game's conclusion, he did not even realize what opening had been played! Admittedly, just because there are a couple of less than accurate tales, this is not to say that all the other anecdotes are inaccurate as well. But, ironically, I find myself in approximately the same position as the author when it dawned on him that his father had lied about the milkshakes at Baskin-Robbins, of all things. In other words, there is a suspicion that the stories in Hoffman's book are not as objectively correct as they should be. To a chess player, the words "King's Gambit" conjure up an opening that is entertaining, albeit slightly unsound. Alas, the same holds true for Paul Hoffman's book by the same name. Many thanks to yet another fellow blogger! Yesterday, I said "Thank you!" to Atomic Patzer. This time, I say it to Michael Goeller of the The Kenilworthian, for annotating my victory in the Philidor Counter Gambit against FIDE master Steve Stoyko. Goeller has coined the expression "Philidor clamp" to describe the game position after 1.e4 e5 2.Nf3 d6 3.Bc4 f5 4.d3 c6 5.O-O f4. But I can not take credit for this line. Actually, it was analyzed by none other than Philidor himself in 1749! To Atomic Patzer, I would like to say, "Danke schone!" My fellow blogger has provided me with links to an article by Maurits Wind on the Philidor Counter Gambit in the April-June 2007 issue of the German chess magazine Kaissiber. You can click here on the first page, the second page, and the third page. On the third page, Atomic Patzer has highlighted a reference to the second edition of my book on the PCG. An October 16th interview of Garry Kasparov aired this weekend on After Words, a program on C-Span 2 that features authors of recent books. I watched the 6 o'clock broadcast last night. Of all the anecdotes told by Kasparov, my favorite one pertains to game 24 of the match in Seville between the two K's. Karpov needed only a draw to regain the title. Kasparov obtained a winning position but blundered it away after the referee startled him by tapping his shoulder, reminding him to write down the moves on his scoresheet. Karpov should now have drawn the game and won the match, but he blundered in return! If you missed the interview, you can catch it here. At yesterday's Viking 4-County Open in Mount Arlington, I won a couple of games as Black with my favorite defenses. 39.Kf2 h4 40.gxh4 Kf4 41.Ke2 e3 42.Ke1 Ke4 43.Ke2 Kd4 44.h5 gxh5 45.h4 Ke4 46.Ke1 Kd3 47.Kd1 Kxc4, White resigns. 19.Kh1 Qg5 20.Qg1 Qxg1+ 21.Kxg1 Rg8+ 22.Kh1 Nxf3, White resigns. This game won the biggest upset prize of $3.65 (5 cents for each rating point!) in round three. In his Blog Trekking, October 2007 post, Mark Weeks refers to my entry about David Remnick's article on Garry Kasparov in the The New Yorker. The movie version of The Natural concludes with a game-winning home run for the New York Knights. But, in the book version, their season ends with a strike out. Unfortunately, for the New York Knights of the U.S. 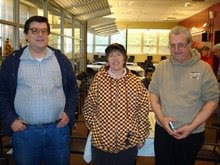 Chess League, their semifinal match on Wednesday night followed the book and not the movie, as they were eliminated from the postseason by the Boston Blitz. The Knights lost the match by a score of 1-2-1. Please be advised that the Viking 4-County Open, scheduled for November 17th at the Stardust Diner in Hackettstown, has moved to a different location. The new venue should be familiar to players who have participated in the Viking Last Saturday Quads. It is the Courtyard Marriott in Mount Arlington, off exit 30 on Interstate 80. You can reach tournament director Ken Thomas on his cell phone number 908-763-6468. Or e-mail him at acn@goes.com. In the sports world, the cities of Boston and New York are natural rivals. Tonight that rivalry carries over into the chess world as the Boston Blitz, who have draw odds, play the New York Knights in the postseason semifinals of the United States Chess League. 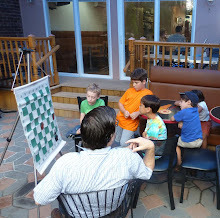 The Knights play their USCL matches via Internet at the Marshall Chess Club. Follow the action, starting at 7 o'clock, on the Internet Chess Club website. If you enjoyed reading King's Gambit by Paul Hoffman (or are in the process of reading it, as I am), you will have an opportunity this evening to meet the author at the Marshall Chess Club. Here is editor Mitch Fitzko's article from Marshall Lore, the club's newsletter. Paul Hoffman. You’ve read him in the magazines. You’ve seen him on TV and heard him on NPR. 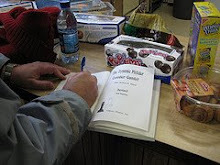 Now you can see him live at the Marshall Chess Club for a special evening on Tuesday, November 13, for book signing. Dr. Frank Brady, President of the Marshall Chess Club, will lead a question and answer session with Hoffman at the event. 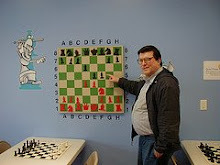 Paul Hoffman, a Marshall Chess Club member, is rated over 1900. I first knew him as an author, when I heard him on the radio promoting his bestselling book The Man Who Loved Only Numbers. 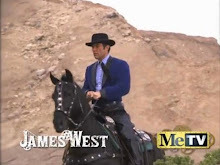 Later I saw him on TV: first on ESPN analyzing one of the Kasparov-computer chess matches, exchanging insights with grandmasters Maurice Ashley and Yasser Seirawan; then on a Nova episode based on his second book, Wings of Madness. His latest book, King’s Gambit: A Son, a Father, and the World’s Most Dangerous Game, is a memoir of his childhood and his own chess experiences, as well as an exploration of international chess. Publisher’s Weekly has called it a “winning book about the ‘royal game’ that will satisfy the general reader, kibitzer, and grandmaster alike.” Books will be on sale at the event. For more information, visit our website http://www.marshallchessclub.org/ or, better yet, visit Paul’s http://www.thephtest.com/. In yesterday's Newark Star-Ledger, there was a feature story on Kurt Landsberger whose great-great uncle was William Steinitz. Landsberger has written a new book Prisoners of War at Camp Trinidad, Colorado, 1943-1946: Internment, Intimidation, and Country Club Living. His first book, published in 1993, was William Steinitz, Chess Champion: A Biography of the Bohemian Caesar. 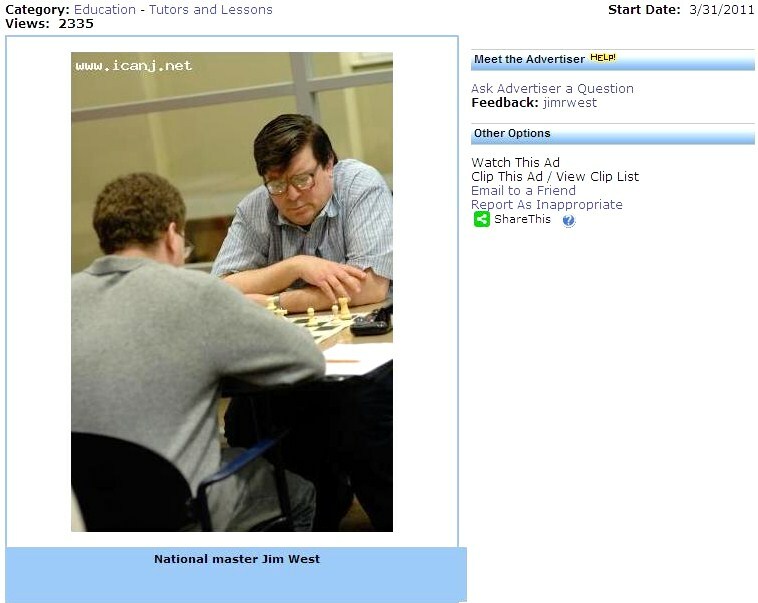 Mitch Fitzko is the editor of Marshall Lore, the newsletter of the Marshall Chess Club. Here is an article from the Fall 2007 issue, which is volume one and issue one. “This is the last night Jay Bonin and those other masters are going to beat up on me,” Larry Tamarkin said. “I’m getting Lasik done next week, so I’ll be able to see.” It was August 16, and Larry was getting ready to play in the Thursday Night Action tournament. With that attitude, I thought, he’s lost even before the first game. Next time I returned to the club, I found out that Larry swept all four games, winning the tournament by a full point. Larry was kind enough to annotate several games for this newsletter, computer assisted by Fritz 10 and HAL 9000. We will limit ourselves to just one game this issue. 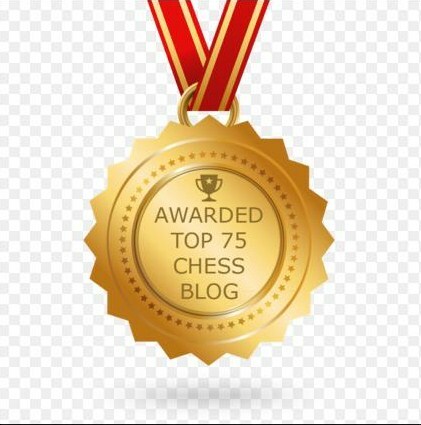 If you can’t wait to read more of Larry’s blend of philosophy, humor, and chess analysis, check out his Memoirs of a Chess Fish series on JeremySilman.com. I played this guy once before and won a nerve-wracking game. This game was almost as crazy because I didn’t understand his ‘nonstandard’ moves. 1.d4 d5 2.c4 e6 3.Nc3 Nf6 4.Nf3 Nbd7 5.Bf4 Be7 6.e3 0–0 7.h3 Bb4!? A very weird move—I tried not to get upset. 7...c5 8.Rc1 a6 9.cxd5 Nxd5 10.Nxd5 exd5 11.dxc5 Nxc5 12.a3= is one of the book-lines. 8.Qb3 a5 9.Bd3 dxc4 10.Bxc4 Nb6= is also perfectly fine for Black. Castling seems good also, with the following possibilities: 10.0–0!? Bxc3 (10...Nb6 11.Nb5! dxc4 12.Bxc4 Bd6 13.Bxd6 cxd6 14.Nc7! d5 15.Nxa8 Nxc4 16.b3+-) 11.bxc3 c6 12.Rab1 is rated by Fritz as a clear advantage for White. I like this position too. Showing my own lack of understanding of the position, after which Black is at least equal again. A better try would be 12.Qb3!? Bxc3 13.bxc3 Nb6 14.c4 dxc4 15.Bxc4+ Kh8 (15...Nxc4 16.Qxc4+ Kh8 17.Rab1±) 16.Bd3±. White maintains a healthy positional advantage. 13.Bxe5 is safer, when 13...Be6 14.Ne2 maintains equality. I rolled the dice here hoping my opponent would mess up first. Of course! The bishop will go to c7, where it will eye the e5-pawn. However, 13...Nc5! looks better. It’s not easy even for a master to find this move because it removes the knight from its lovely perch. I think the brutal honesty of computer evaluations is succeeding in making chess a much uglier game! Fritz’s line goes 14.Be2 Ne6 15.Bd3 Nxf4 16.exf4 Qh4 17.Ne2 Be7. I feel the position is about equal, though Fritz says it’s +0.37 in Black’s favor. Another mistake—of course mistakes are allowed in a 30–minute game—LOL. Better is 15.Na4 Qh4 16.f3 Ng5 17.Nc5 with equality. Another mistake. After 15...Bc7, best is 16.Bxe4!? (I was intending, 16.f3 Nc5 17.Be2 Bxe5 18.Bxe5 Qxe5 19.Nxd5 which is equal, but all these crazy moves were getting me confused.) 16...fxe4 17.Rxd5! Bxh3 (17...cxd5? 18.Nxd5 Qf7 19.Nxc7 Rb8 20.e6! wins.) 18.Rd2 Be6 19.Nxe4 and White is slightly better. With the clock ticking away, we are making enough lemons to make lemonade for the whole club. Black cracks. He wants to attack here but maintaining the horse on e4 is not enough justification for this anti-positional move. He should’ve tried 16...Bc7!? 17.f3 Nc5 18.f4 Ba5 19.Nd4 Nxd3 20.Qxd3 Bb6 and Black is better because of his two bishops and less rigid pawn-structure. 17.Nd4 Bb6 18.f3 Nc5 19.Bxf5! So I win a pawn. The rest is, relatively speaking, smooth sailing. A weak move even though White is still winning. Better would have been 29.Qg2! Rae8 30.Rh3! 29...Rxf5 30.gxf5 Qxf5 31.Qg2+ Kf8 32.Rh3 Ke7 33.Qg7+ Kxe6 34.Rh6+ Nf6 35.Re1+, Black resigns. I intended to answer 35...Kd6 with 36.Rxf6+!? Better, though less fun, would’ve been 36.Qe7#. Larry also beat FM Asa Hoffmann on the road to perfection. Of the ten players in today's game/30 Swiss at Cherry Hill, seven including myself were masters. Under the circumstances, playing four masters in a row, I finished with a respectable score of 3-2-0. Here are my two wins against masters. 25.c5 Rd7 26.Rc4 d5 27.Rc3 Qe6 28.Qg4 h5 29.Qxe6 fxe6 30.b4 Rdc7 31.Rcd3 f5 32.g4 hxg4 33.hxg4 Kf7 34.g5 Rh8 35.f4 Ke8 36.Rh2 Rxh2 37.Kxh2 Rh7+ 38.Kg2 Kd7 39.Rb3 Kc6 40.a4 d4 41.exd4 Kd5 42.b5 axb5 43.Rxb5 Kxd4 44.Rb6 Re7 45.c6 bxc6 46.Rxc6 Kd5 47.Rc2 Ra7 48.Ra2 e5 49.Rd2+ Ke6 50.fxe5 Kxe5 51.Ra2 Kf4 52.a5 Kxg5 53.a6 Kf6 54.Kf3 g5 55.Ke3 Kg6, Black wins. 31.exf5 Rh2+ 32.Kf3 Ree2 33.f6 Kd7 34.f7 Ref2+ 35.Kg4 Rxf4+ 36.Rxf4, Black resigns. The New York Knights advanced to the semifinals in the postseason of the USCL by defeating the Philadelphia Inventors on Wednesday night, by a score of 3-0-1. At Sarah's Chess Journal, I found this brief biography of Francois-Andre Danican Philidor. Last week, the New York Knights qualified for the playoffs in the U.S. 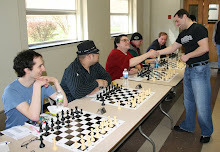 Chess League by eliminating the New Jersey Knockouts. Tonight, at the Marshall Chess Club, the Knights will play via Internet against the Philadelphia Inventors who have draw odds in this postseason match. You can follow the action, beginning at 7 o'clock, on the Internet Chess Club website. Two weekends ago, my chess student Ziping Liu won quad 1 at the King's Chess Club Quads in Randolph with a score of 2-0-1. Here is his third round draw which clinched first place. 14.Qe2 Rae8 15.f4 Nd7 16.Bxe7 Rxe7 17.cxd4 exd4 18.Qf2 Nb4 19.Qd2 a5 20.e5, draw. At Frederic Fournier's blog Contre Gambit Philidor, there is a good example of how not to play the Philidor Counter Gambit. Games like this give the PCG a bad name! The correct way to handle this sharp variation was shown in Piorun-Markowski, Polish Championship 3/25/2006. In today's Game/40 Swiss at Westfield, held in honor of Ernesto Labate, I finished with a score of 3-2-0. Here is my best game as Black. 37.Kf3 Kf7 38.Kf4 Ke6 39.g4 b5 40.Nb3 Kd5 41.Ke3 Nc4+ 42.Kd3 Nxb2+ 43.Ke3 Nc4+ 44.Kf4 a5 45.Nc1 b4 46.cxb4 cxb4 47.Nb3 a4 48.Nc1 b3 49.Ne2 a3 50.Nc3+, White resigns. While searching on Google, I came across Macon Shibut's book Paul Morphy and the Evolution of Chess Theory which includes some of my analysis on the Philidor Counter Gambit. Their inaugural season in the USCL ended with a resounding thud for the New Jersey Knockouts as they were...well, knocked out of the playoffs by the New York Knights. The final score of the match was 1-2-1. Congratulations to the Knights on their qualifying for the postseason! Todd Lunna has mailed a letter to all persons who have played at the Westfield Chess Club this year asking for their participation in the Ernesto Labate Grand Prix which will be held on Sunday, November 4th, at Westfield. As of Monday, October 29th, only 7 players had entered in advance. There is guaranteed prize money of $2,000. In addition to the advertised prizes, Lunna will add an under-1500 prize if there are at least 3 entries below 1500. The entrance fee is $75 at the site, but you may qualify for the early entrance fee of $60 if you e-mail Lunna at lunnaco@aol.com. The tournament is a 5-round Swiss with time control of game/40. The first round starts at 12 noon, which will feel like 1 o'clock in the afternoon because daylight savings time ends in the wee hours of Sunday morning. Don't forget to turn your clock back! You will need ID to enter the building.